So your little one has been an awesome little sleeping machine since they were an infant and you have filled their cute little belly with love and nourishment before they go to bed each night. Sometime around their first birthday, most parents are ready to say good-bye to the bedtime bottle or the bedtime breastfeeding session for various reasons. If you are breastfeeding your little one, there is absolutely no rush on my part. I am proud that many breastfeeding mamas say that I have saved their nursing relationship through improved sleep. Many have decided to do extended breastfeeding into toddler hood and beyond. For my bottle-fed babies, I do recommend that you say good bye to the bedtime bottle around the first birthday, and definitely by the time your little one is two years old. Why stop the Bedtime Bottle around the first birthday? Why are most parents ready? Sleep is all about SKILL at this point – the ability to go from Point A) Awake to Point B) Asleep. You can read more interesting facts about sleep here: FAQ. The vast majority of parents are confident that their children are getting adequate calories by day and no longer require this bedtime bottle top before bed. I know you are going to fill up your little one with lots of love and healthy nourishment all day ling, so they are going to sleep well by night. This applies to 99.9% of babies this age. If you feel your child falls into the less than 1% category, please get in touch for personalized support and assistance. Most babies have teeth at this age and will be getting more. This saves you from having to brush their teeth again mid-way through your bedtime ritual, or from having your baby go into the crib with milk deposits left in their mouth. Some babies are no longer interested in the bedtime bottle after bath, so why force it? This was the case with both of my children. Starting at about 10 months, they were no longer interested in the top up after bath. I kept it in for about a month longer, as I loved breast feeding, but they weaned themselves off that particular session and we continued nursing by day. 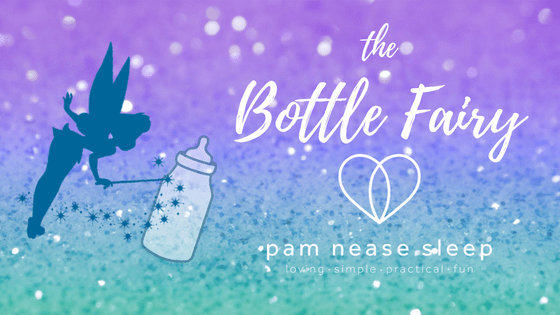 Most parents are moving their children to sippy cups or regular cups around this age, so it is a natural progression to eliminate this bedtime bottle. For breast feeding families, many are also introducing cups with water and other healthy beverages for their little ones to drink by day. 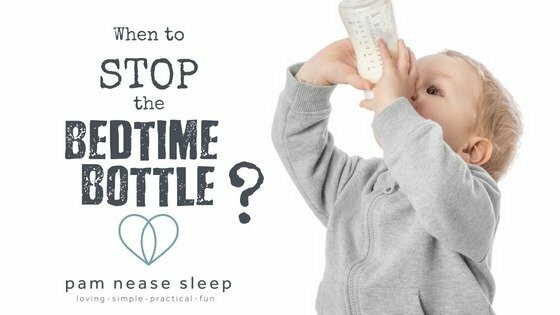 Keeping the bedtime BOTTLE beyond this age, can CAUSE problems! In my 9+ years of full time consulting, I have not encountered problems with bedtime breastfeeding sessions beyond the first birthday, but I HAVE seen problems with bedtime bottles. In one extreme case, a bouncing 18 month old baby boy was drinking 18oz of formula every night before bed. He did not need the bottle in order to fall asleep – he was a great independent #SuperSleeper as his parents had hired me when he was about 6 months old. That was not the problem. The issue was his supper. He refused to eat his solid foods knowing that he would get his “preferred meal” at bedtime. They had the same issues during the day, so I helped them say good bye to his bottles in a loving and fun way. Marital relationships are important too! 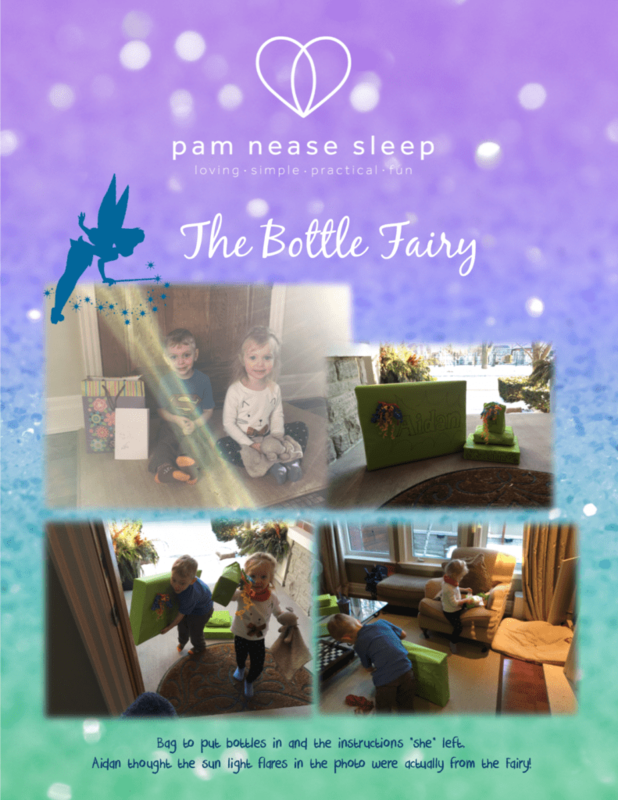 When you hire Pam Nease Sleep, you know your little one is going to be able to sleep anywhere and for anybody. For my exclusivly breastfeeding mamas, they know they will be able to go out on a date at 7ish after the bedtime nursing session and leave their little one with a trusted caregiver to complete the routine. When their little ones are around a year old, some parents would like to start their date earlier! Even with all this flexibility, starting a date at 5pm instead of 7pm is still very appealing for exclusively breast feeding families. Can you blame them? Here’s to extended nursing, great sleepers and strong, happy and healthy family relationships! Okay Pam – so How Do we Do It? **We are not suggesting weaning from this pre-bedtime breastfeeding session unless you as parents WANT to or you think your baby is ready. Many of our breastfeeding clients continue nursing before bedtime routine right into toddlerhood and beyond. As scary as it will be for you wonderful parents, it will be easy-peasy-lemon-squeezy to your sweet little muffins. If you are breastfeeding , then on your fateful night of saying good bye to the top up feed, have DAD (or another trusted caregiver) do the bedtime routine 100% on their own for TWO evenings in a row. If you would like to keep in an evening nursing session, move it to BEFORE bath rather than afterwards, follow step 1 as above. TRUST your little one! There is a real science to the bedtime ritual. This is one of the many reasons the top up was after bath and before books – to help prepare you for this eventuality – to help make it seamless. Your child will be focused on the wonderful loving and bonding activity of reading books and singing songs that you have been doing for weeks or months prior. You can read more about bedtime routines here: Make Bedtime Fun!, The Power of Song, Bedtime Story. Do NOT replace this feeding with a sippy cup of milk, warm cup of milk, a bottle, or even worse – a bedtime SNACK. Please TRUST me on this as it will cause MORE problems down the road. I will be writing another blog post on this very subject and will include a link when it is up. Please trust your precious little one – sleep is all about skill at this age. A little bit of food or milk just before bed will not help them sleep peacefully for 10 to 12 hours. I promise you that as long as you have been following my advice since you hired Pam Nease Sleep, your little one will not wake up hungry in the night. Here is to extended nursing if you choose to do so. Continue to enjoy all that great sleep and all that great nursing as long as you like! As scary as it will be for you wonderful parents, it will be easy-peasy-lemon-squeezy to your sweet little muffins. If you are bottle feeding – on your fateful night of saying good bye to the bedtime bottle, have the “opposite parent” do the bedtime routine 100% on their own for TWO nights in a row. If you have been alternating consistently since your little one has learned to sleep, then toss a coin on who does the first bedtime without the bottle. If you would like to keep in a bottle in the evening, move it to BEFORE bath rather than afterwards, follow step 1 as above. Do NOT replace with a sippy cup of milk, warm cup of milk, a bottle, or even worse – a bedtime SNACK. Please TRUST me on this as it will cause MORE problems down the road. I will be writing another blog post on this very subject and will include a link when it is up. Please trust your precious little one – sleep is all about skill at this age. A little bit of food or milk just before bed will not help them sleep peacefully for 10 to 12 hours. I promise you that as long as you have been following my advice since you hired Pam Nease Sleep, your little one will not wake up hungry in the night. Continue to use bottles by day and move to sippy cups exclusively when your family is ready to do so. I am not your feeding expert – I am your sleep expert, but I would recommend that you say good bye to daytime bottles by the time your child is two years old at the very latest. Asking a toddler to say good bye to their bedtime bottle is WAY more challenging than when they are a baby. We all have habits and the longer we have them, the harder it is to change them. To be successful with this age group – as scary as it is – you have to go cold turkey. Meaning no more bottles AT ALL – during the day AND at bedtime. For these toddlers, I suggest using a super FUN motivational strategy called The BOTTLE FAIRY. ** You can find the step-by-step guide HERE. *As always, this is not medical advice. If you are concerned with your child’s feeding, please consult your IBCLC Lactation Consultant, Pediatrician, Family Doctor, or preferred healthcare professional. Make sure to celebrate your new-found freedom with a DATE NIGHT or a night our with friends! Take a selfie and share it on our Facebook page or on Instagram with #PamNeaseSleep #SuperSleeper. For personal support and advice, please book a complimentary 15 minute telephone consultation to discuss your particular situation and best steps going forward. We look forward to hearing from you! As you may know, we are always posting on social media about all our Super-Dad clients and how we adore them. They come to us exhausted and feeling like they are unable to help their wives and babies. Some are totally hands on and doing all they can to help the mommies get some sleep. Some dads work away from home, and either don’t understand the depths of sleep deprivation their partner is feeling, or they do – but feel helpless to change that. Some have been banished to a spare room or the couch, or they choose to sleep there to get a couple hours of zzz’s in before having to be functional at work. Some are at a loss with how to help their wives who are struggling with postpartum depression, and are possibly teetering on the brink of depression themselves. We have dads who WANT to be helpful, but their partner’s won’t relinquish control – feeling like only they can nurse, bounce, rock, shhh, sing or sway in just the *right* way to get baby to sleep. The ONE thing almost ALL dads have in common is that they are very skeptical and concerned about the financial investment. It feels like a BIG risk. We get it. We get the JOY of seeing the transformation of these fathers. We validate their concerns and ask for their input along the way. We ask them to STEP UP and be involved in their new sleep plan. We give them the direct (and sometimes scientific) answers they are looking for. We provide a loving, simple, PRACTICAL, and easy solution with clear steps to follow. We are here to support their family and answer all their questions along the way. Dads who are confident that they can put baby to bed easily and without fuss. Who know their wives can go out for girl’s night (or weekend! ), and all will go smoothly. Dads who can trust their baby will sleep All.Night.Long. Dads who have alone time with their wives each night, and are able to prioritize their marriage. Dads who stay home and nail it all day while their partner works. Dads who are rested for work in the morning. Dads who come home and get to have FUN before bedtime with their little ones (Yes! You CAN wind them up before bed!). And most importantly, it empowers dads with new, DEEP bonds to their children. That is our most favourite part. Now what do these dads confess that they would do differently? What is their advice to YOU? They would’ve hired us sooner. They wouldn’t have struggled so long on their own. They would tell you to just do it already! They wouldn’t have stressed out about the investment. They all say it’s the best money they’ve ever spent. These Super-Dads would tell you to take the risk. You will not recognize your life in a few short weeks. Initially, I was sceptical about hiring a sleep consultant for our son William, but then again, I wasn’t the one who had to get up several times each night, and didn’t really understand how exhausting mini naps were for William and my wife during the day. We thought he would likely grow out of these sleep problems, or we felt that maybe this was normal for an infant, or he might be teething, or maybe he was going through a developmental phase, etc. My wife was reading all sorts of books, and trying to get advice from family and friends, but nothing helped. He might go through a phase where night sleep and naps lengthened, but never for long. I supported my wife in listening to what our consultant, Pam, had to say. We were surprised and relieved to hear that sleep is a skill that all babies need to learn. The ones who sleep well simply had learned it, the ones who don’t simply have not learned yet. My wife was afraid that helping Will to learn was going to be hard on him and us. It wasn’t. Pam gave us a gentle and effective sleep training process for Will. I did the nights and he was already sleeping better the first night, and then by night 3 he slept through. I felt proud of my son, and he obviously wanted the sleep as much as we did. My wife worked with Pam over the next few weeks to get him sleeping well during the day. Now, after one month, William sleeps 12 hours at night, and two long naps during the day. He is very happy and we can now take him to friend’s houses and put him down and he goes right to sleep anywhere for naps and bedtime. Now, my wife and I have our evenings free and we all sleep long and peacefully. I would highly recommend Pam and encourage other fathers to support their wives solve their baby’s sleep issues. It was worth every penny we spent! Don’t wait – hire Pam immediately! It’s the best money I have EVER spent! Initially, when my wife approached me about hiring a sleep specialist, I dismissed it. I felt that A) we had not exhausted our other options B) I didn’t know any better C) it was a lot of money. However, once we actually called Pam, I was at that point where I was willing to try anything. I felt we had exhausted all other options and I was very worried about my wife’s health and my job performance. Looking back now, I wish we had called Pam sooner. My greatest fear when we hired Pam was that it would not work and we would still be sleepless and now out money. I really had no idea what we would have done had it not worked out. I was very skeptical because everything else we had tried prior to Pam had never worked. I was hoping that our son would simply outgrow his sleep issues but not until he was much older and we could reason with him. We simply couldn’t wait for that as my wife and I were too far gone. After working with Pam – in the end – I felt like it was magic. I was truly incredulous, and of course thrilled that we were getting so much more sleep. Don’t waste another minute deciding if this is a good idea or not – it is! You won’t regret hiring Pam to help you and your family. I would just like to say thank you very much to Pam Nease. My wife and I have a four year old daughter (Teagan) that has been challenging to put to bed to say the least. We had to sit right beside her in her bed to have her fall asleep, which progressed to us sitting outside her room within eyesight. We could never progress past that point for two years I was sitting outside her room for upwards of 45 minutes a night. We were very frustrated but clueless as to what to do next. Then Pam entered our lives and set up a very comprehensive plan for us with lots of support from her. Pam told us we could have Teagan sleeping by 7 pm every night ( not 9 pm as she was) and she will stay in her bed all night. Teagan was coming into our bed every night at around 1 am, and this happened for two years. When Pam was telling my wife and I what we could expect in changes with Teagan’s sleep patterns it was like a dream world. We began with Pam and the results have been amazing. Teagan does go to bed every night without a fuss and sleeps in her room till 6 am. Pam Nease’s professionalism and compassion for parents going through this process is comforting. When you do work with Pam it is a partnership and you need to do your part and with Pam’s plan and follow up you will achieve success. This was the best money spent, my wife and I have our evenings back. Thank you Pam!! I was a little skeptical when my wife told me she hired a “sleep consultant” but when Pam came to our home, she was warm, professional and knowledgeable. She had all sorts of suggestions and advice right from the start. She put my wife’s mind to rest and helped her and myself understand what our baby boy needed to become a great sleeper. Pam worked with us when Chase was 3 weeks old for some tips and then at 15 weeks. By night 4 our little guys was sleeping 11+ hours a night and he is now going on 5 1/2 months and is a rock solid napper and a rockstar sleeper. My wife and I are able to enjoy time together and go to sleep knowing our little guy is sound asleep for the night. He is happier and way more content. He does not use a soother or any kind of prop to go to sleep. He gets a song and his Rudy the rabbit and he goes to bed with a big smile on his face and puts himself to sleep. Without Pam and her guidance, we wouldn’t have benefited as much from just a book on its own. If you are a dad and reading this….trust me when I say, this was worth every penny. My wife is a new woman and she deserves it. I just wanted to say thank you again for giving my wife Amanda and I the tools to give the gift of sleep to our almost 2.5 year old son and almost 8 month old daughter. Although the implementation of the information was our job, the ease with which you dealt with us and guided us was phenomenal. It is amazing that Hudson, who used to wake up 2 – 3 times per night and be a total bear at bed time, now loves going to bed and can do it on his own knowing we are out in the living room and also sleeping 11 – 11.5 hours a night. Our daughter also sleeps 11 – 12 hours a night when she used to wake up 2 times a night and need to eat one of those times. She also now only needs to be laid down and will fall asleep within 5 minutes on her own. All of this within 3 weeks?!?! AMAZING!! You are great to deal with even though my wife did all of the calls and I got the information second hand. If anyone is contemplating using your services, I would highly recommend that they do. I hope that the success stories on your page including this one persuades them to proceed. My wife and I hired Pam when our son was seven months old on the strong recommendation of a friend. Although our tenure as parents has been brief, without question hiring Pam as a sleep consultant was by far the best thing we’ve ever done for our son – and for ourselves. Before Pam our son Jack wasn’t a terrible sleeper, but he was inconsistent. He would wake up throughout the night and lacked the skill to put himself back to sleep and was at a point where he could only be put down by my wife or myself. Jack was also heavily reliant upon a soother during the night, which as we learned from Pam, interfered with his ability to attain a deeper REM sleep. However since implementing Pam’s sleep training program, our son now naps like a champion and sleeps straight through the night for up to 11 or 12 hours! As a result, Jack is more rested and happier throughout the day and the time we spend with him is now even more enjoyable. Although initially we were nervous about the prospect of sleep training and having to hear our son cry, after a Skype video conference with Pam we quickly realized that her program is designed around the concept of giving our child the gift of sleep. Pam’s support gave both my wife and I the confidence to stick to the training, and thanks to her wealth of knowledge and her ability to answer any and all concerns or questions we had along the way the first few days of sleep training were much easier than we had anticipated. However, what truly makes Pam’s service unique is not just her expertise in her field, but also her wonderful personality. Pam’s warmth and kindness is evident immediately upon talking with her, and her sincere care and concern for her clients is second to none. Pam makes what could otherwise be a stressful experience easy and fun, and we will forever be indebted to her for teaching us how to give our son a better quality of life and ourselves a newfound freedom as parents. I thought my wife was INSANE when she said she wanted to hire a sleep consultant but I was desperate so figured we may as well give it a shot. We have never slept so well, and I couldn’t be happier. I enjoy being a father now and am amazed by my little man. Thanks Pam. Our son Jack was 3.5 years old and typically took +3 hours to get to sleep EVERY night. We would start at 8:00pm and it would end when one of us passed-out. We really thought we could handle this ourselves because my wife is a primary school teacher and a certified behaviour modification specialist. We had read a plethora of books, tried a variety of techniques but nothing seemed to work for us. We were sleep deprived and at wits end when we reached-out to Pam Nease. From our first conversation, we knew we were in good hands with Pam. She had a compassionate and direct way to deal with the matter. What we learned was the correct strategy was actually a composite of everything we had read, finely tuned and specific to our needs. The program was modified slightly based on exhibited behaviours and we attribute that fine tuning to our success. Having spent literally years battling this problem, we could not believe that within a few days, Jack was regularly in bed and asleep before 8pm and would not get-up before 7am the next morning! He was completely habit formed in under a month. It has been 5 months now and Jack is a different child. He’s a happier child and his mental capabilities have increased exponentially. Time-outs were a regular occurrence for Jack and in the past 5 months, he’s been timed-out twice. Needless to say, I would highly recommend this program to any parent struggling with these problems. It is absolutely without a doubt the best money we have spent on anything! Thanks to Pam, we have our lives back. We went for dinner with Devin and Matt and another couple last night. It was a PAM LOVEFEST! We both ranted and raved about you to this other couple to the point that if they aren’t sold on you, I don’t know who could sell them on the process – lol! It was quite funny, I am sure they thought we were both nuts! Thank you again for all your help with our respective families in Kelowna and Calgary. We are happy to tell you all is well at our home. It’s been one year since we contacted you about Jane. Bed times are no longer the screaming fight or laying with her till she falls asleep (or we do). The other night we read books in Henry’s room and after our song and dance, she did her round of kiss and hugs, and walked to her room. She had her light off and was in bed before I got there. We lost the afternoon nap a while ago but is sleeping from 730 to 7 just about everyday. Henry is a little man now. He is still sleeping through the nights. He was 3 months when we talked to you for him. Now hes 13 months, walking and climbing. 730 to 6 is his normal. He’s gone down to one nap, for about an hour and a half to two. When people tell us about their sleep issues, we try not to brag or preach. I look at hiring you as the same as swimming lessons. Everyone should learn how to swim it’s a life skill. We spend money on that why won’t we on sleep. Pam, it’s coming to the end of our 14 day sleep training schedule here, and I just want to thank you for all your help. Jessica has been a complete delight to work with!!! Thet, Madee and I cannot believe the change in his sleep patterns and we have Jessica to thank for that!! I really didn’t expect such a drastic change so quickly. We really cannot believe it!!! I don’t want to jinx ourselves, but Jack is sleeping well and is much happier!!! Thank you for giving us the tools to start this journey. It has been a great experience, albeit difficult at times, but so worth it!! Thank you!! Jessica really is an awesome and intelligent woman and you are very lucky to have her with you! Are you blurry eyed due to your darling child wanting to start the day at 5:30 am like mine used to do? He was so HAPPY about it but I sure wasn’t. I would mutter under my breath, “F me, Max it can’t be 6 am yet. Why the bleep are you out of your bed?” Not the best way to greet your child, I know. It took a while. I adjusted his bedtime and got him to bed a half hour earlier and two or so weeks later, his body finally adjusted and we were back to 6 am or later. For more early waking advice, see my blog posts about Early Wakings and Are You Praying for the Elusive 7am? Over the past 10 years, his wakeup time has fluctuated between 6 and 7. On growth spurt days, he would sleep in until 7:30 or 8:00 am. Oh, how I loved those mornings when he was a baby. I have to say though, that he is my early riser of my two children. I have not been filling out sleep logs for 10 years, but I am pretty confident that he has been closer to 6 than 7 most days. I can live with that and I actually prefer it now that he is in school. He wakes up well rested and we are not rushing in the mornings like many other parents are. From time to time, he still wakes up before 6 am. It is going to happen. 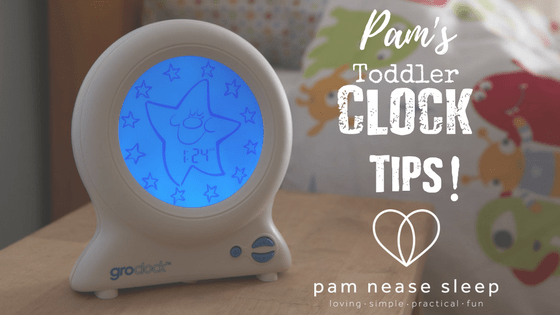 A Toddler Clock is a useful and FUN tool for your early riser. My goal is that your little one gets excited to say goodnight to the toddler clock every night at bedtime and that they sleep through the night. The first time they notice it again, is in the morning when they wake up naturally – on their own – and the clock already says it’s appropriate to get up and start the day. I want this to be true at least 95% of the time. The other 5% of the time or less, if they wake up in the night they can glance at their clock and then relax in their cribs or their beds feeling safe and secure with their loveys, and go back into sleep until morning (see The Lovey – Use a Transitional Object to learn about the all important lovey). If they wake up at say 5:30 am – instead of yelling, calling or crying – you can teach them to snuggle up with their lovey and try to go back to sleep until the clock says it is time to get up. In the case of early morning wake ups, they may not go back to sleep, and that’s okay. Relaxing and snuggling with their lovey is still good. Tip #1 – Have some FUN and Roleplay! To help your child understand how their toddler clock works and what you will be expecting of them, explain it all during the DAYTIME. I have instructed clients to do FUN role play with their kids. You can use stuffed animals or puppets so that they can understand when it is time to sleep and when it is time to wake up. Lose your inhibitions and have fun on a weekend afternoon when you have the time available. Trying to introduce the clock at bed time for the first time, or even worse in the night, is never a good idea. I also recommend that you make it EASY for your child to be successful in the beginning. So, for example, if they are currently rising at 5:30 am and you want them to be quiet (preferably sleeping) until 6 am, then set the clock for 5:35 am and keep inching ahead slowly to 6 am. This will save you all a lot of heartache, tears and meltdowns in the morning. You do not want your little person to get discouraged. Tip #3 – Consistency All.The.Time. The clock strategy will NEVER work if you let them get up BEFORE the clock says it is appropriate to do so. If and when your child wakes in the night or in the early morning, go to them and remind them it is still sleepy time and reference the clock. Over time with practice, consistency and continued education, they will begin to understand. There are lots of great Toddler Clock on the market. Our fave is the Gro Clock, and I wrote more about it when we gave one way HERE. It has a built in nightlight and you control the brightness – or turn the light right off. It has a function for Bedtime and another for Naptime or Quiet Time. If you want to get your hands on one, check it out below. And if you don’t have the budget for a shiny new clock, I have recommended that clients find an old digital alarm clock and put tape over the last two digits. Then, you can teach your child that they need to wait for the number 6 or the number 7 to get out of their bed. We hope you have a BLAST teaching your little one how to use their new big kid Toddler Clock! We offer a 15 minute complimentary telephone consultation so you can see if we are a good fit for your family. Call me at 250.575.6988 or CLICK HERE to set up an appointment, I look forward to hearing from you! Could Growing Pains be Waking My Child at Night? Is it “Growing Pains” or is it something else? In this week’s Coffee & Q’s, Pam addresses the research that best explains what is happening to our children’s bodies when they are complaining of leg cramps or pain. 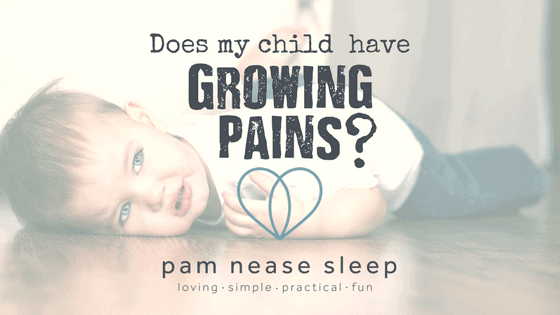 Over the past 7 years of sleep consulting, I have heard many parents referencing concerns of “growing pains” as a cause for why their children are waking up in the night. If your child has had a particularly active day and you are concerned about muscle pain waking them in the night– but would prefer not to use over-the-counter pain medication– ensure they stay well-hydrated, consume foods high in magnesium ie: leafy greens like spinach (Popeye was onto something! ), beans, nuts, and seeds (providing there are no allergies). Also, If they are old enough, encourage them to stretch after exercising, or you can massage their legs before they go to bed. Why Does My Child Wake Up at Night? One of the most frustrating things for a parent, is when their baby wants to wake up prematurely from a nap, multiple times in the night, or too early in the morning. When we have a brand new baby, we expect that. Many parents are misled to believe that their children will grow OUT of their sleep problems, but the reality is that they just grow INTO new ones. We are often hired by parents of older children, who are struggling sleep issues with nightmares, night terrors, sleep walking, sleep talking, broken sleep, etc. … all on their OWN.